I’m making no excuses for how easy these are; there is enough food preparation to be done at this time of year! If you want a quick batch of something delicious to serve warm, these are perfect. 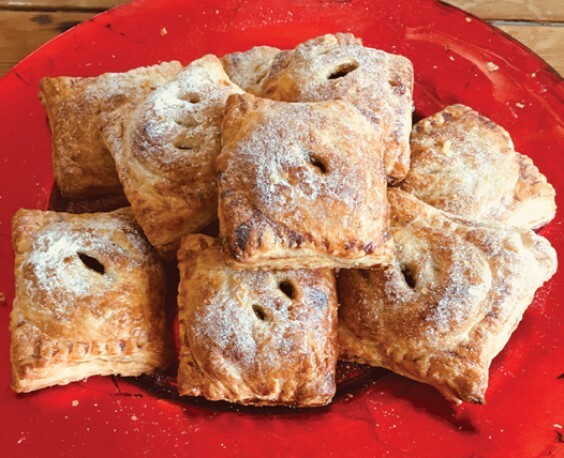 My Mum would call these “turnovers”, not pies, and because they are made with puff pastry, they are light, so can even be pleasing to mince-pie-haters. Ideally, these would use the mincemeat from my November article, but any mincemeat is fine. 1) Pre-heat oven to 220C / 200C fan / Gas 7. Lightly grease two baking sheets. 2) Unravel the puff pastry and roll it out lightly, to even the surface and make thinner. 3) Using a sharp knife, cut the pastry in half lengthways and then into five widthways, to give you ten small oblongs. Transfer to baking trays, then put a mound of mincemeat on each. 4) Use the egg wash to paint a seal around the edge of the pastry and then fold each one over, to encase the mincemeat. Seal the edges by pressing them together with a fork. 5) Cut small vents in the top of each one with a knife, then brush with egg wash and sprinkle with the sugar. 5) Bake in the oven for 10 mins, then turn the trays round to bake evenly and cook for a further 5 mins. 5) Remove from the oven, transfer to a wire rack and leave to cool slightly, before dusting with icing sugar for snowy effect, if liked. 5) Store any that don’t get eaten immediately in an airtight container, but I recommend eating them still warm from the oven, with a cheeky glass of sherry. . . well, it is Christmas!